Well let's see - I made it back here before another year was up! So much has been going on. I last posted in September...in November we had a big birthday party for my parents - my mom was turning 80 and my dad 85. I did all the invitations and centerpieces and helped with the menu, etc. The party was a huge success! Just two days after the party, ON my dad's 85th birthday, he had a massive stroke. Enough already! I'm happy to say he has recovered quite well - still some speech issues but not bad at all. 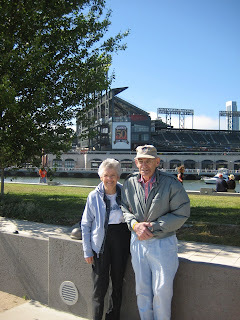 They were able to come down here for a visit in May and even made it to a Giant's game. So there has been a bit of stress and a lot of phone calls. We aren't going anywhere this summer so I'm hoping it will be a chance to regroup and energize. We shall see. Thank goodness for RSS feeds. :) Great to see you back.